The Dalhousie Tigers men’s hockey team wanted to send a message—a message that was heard loud and clear Jan. 21 at the Halifax Forum as the plucky Tigers refused to surrender. After a shaky start against the rival Saint Mary’s Huskies which saw the Tigers fall behind 5 – 1 midway through the match, a furious, but gutsy, comeback attempt fell just short. It’s the type of effort that perhaps wasn’t shown by the Tigers in the first half of the season. It was the Tigers’ second consecutive game this past weekend against the Huskies. They earned a 4 – 3 overtime win the previous night in the home-and-home series. What began as a dismal first half in which the Tigers lost 11 games in a row has suddenly become a remarkable turnaround. Following a long-awaited 1 – 0 triumph over St. Thomas Jan. 6, the squad has shown resiliency to contend for an AUS playoff spot. After this weekend’s two games, Dal is sporting a much improved 4-2-1 record since the holiday break. Stealing two points Jan. 20 thanks to Jordan Villeneuve-Gagne’s overtime winner against a team which has fared much better than themselves this season only helps Dal’s playoff hopes. The win closed the gap between Dal and St. FX, who currently sits in the sixth and final playoff spot by just one point. Despite blowing an early 2 – 0 lead, the Tigers managed to squeak out the win. A power play goal by Pierre-Alexandre Vandall early in the third period gave Dal their second lead of the game. The 3 – 2 advantage didn’t last long, however, after Cory Tanaka of the Huskies fired a slap shot high glove side past goalie Wendell Vye to tie the game at three. It was Vye’s third straight start since No. 1 goalie Bobby Nadeau re-injured his groin. Nadeau is out for the remainder of the season. “I just took it shot-by-shot,” said Vye, who had 29 saves. He kept his team in the match as the Tigers struggled defensively for numerous stretches in the third frame. Vye’s most important save came late in the closing period. Luck, it would appear, was not on the Tigers’ side the next evening. Adding insult to injury, the Tigers lost forward Shea Kewin. He was hit from behind by SMU forward Justin Wallingford. After digging themselves into a 6 – 2 hole to begin the third period, the Tigers fought back. Frustration levels were also high as both teams got into penalty trouble. Dal responded to the adversity by capitalizing on their power play opportunities, adding two more goals to pull themselves within a respectable margin. The Tigers, however, would not score any further, falling 6 – 4. The road ahead is not an easy one for the Tigers. With seven games remaining, Dal faces off against a number of the league’s best teams, including CIS-ranked UNB, the top team in the country. The Tigers are in tough this weekend. They visit Charlottetown to battle fifth-place UPEI on Jan. 27 and then they head to Fredericton for a match against conference-leading UNB. 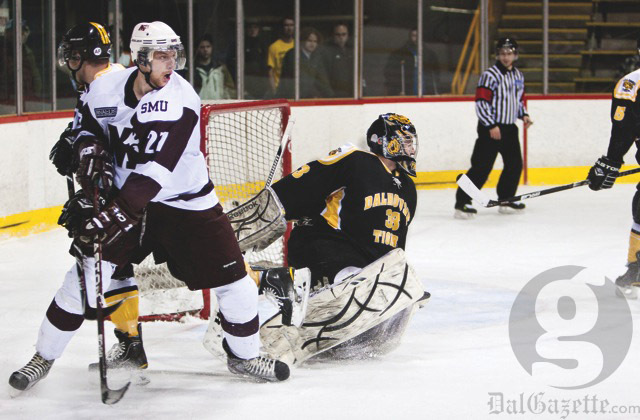 Puck drop at both games is 7 p.m.
Editor’s Note: Saint Mary’s forward Justin Wallingford was not assessed a checking from behind penalty Jan. 21 against Dal, so he was not suspended.